The Coliseum is a new feature that allows players from different platforms (Android, iOS, Amazon and Windows Phone) and language versions battle with each other in real time. During the event, the Coliseum will be accessible from an icon on the top right of your base. Tap on the icon to access the Coliseum interface. 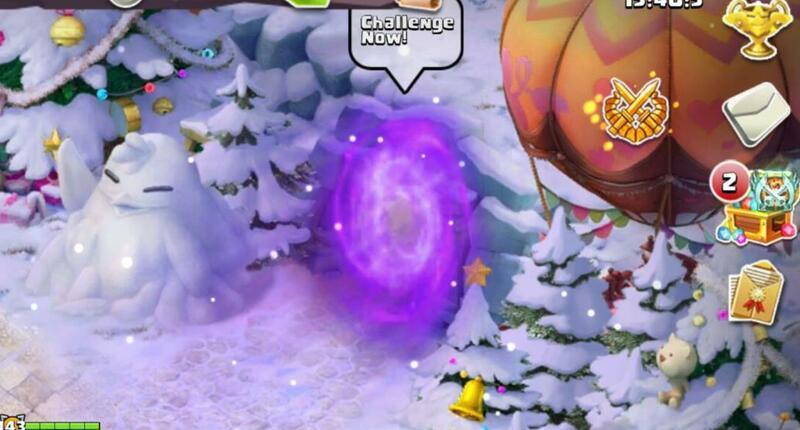 The Coliseum can also be accessed through the Hero Trials portal and the treasure chest icon (“Limited” tab). The Coliseum icon will be removed when the event ends. The Coliseum uses a battlefield similar to the Hero Trials. A new building, the Shrine, will be introduced in the Coliseum. The Shrine's level is based on your level. The Shrine will be 10% of your current level (rounded down to the nearest whole number). The highest level for a Shrine is 15. Shrine Skill: Attack the nearest enemy, dealing a small amount of damage in an area. The Coliseum will open from 00:00 - 04:00, 08:00 - 14:00 and 18:00 - 22:00 EST (GMT -5) every day. The Coliseum event will be available till the next update. Tap on the “Find Battle” button to search for a suitable opponent. You can cancel the matchmaking before an opponent is found. Once an opponent has been found for you, the battle loading screen will appear and your battle will commence shortly. You’ll be randomly assigned to the Home or Away team. The Home team will be located at the bottom. The Away team will be located at the top. The battle will commence shortly after the battle loading screen reaches 100%. Auto-battle is not available in the Coliseum. 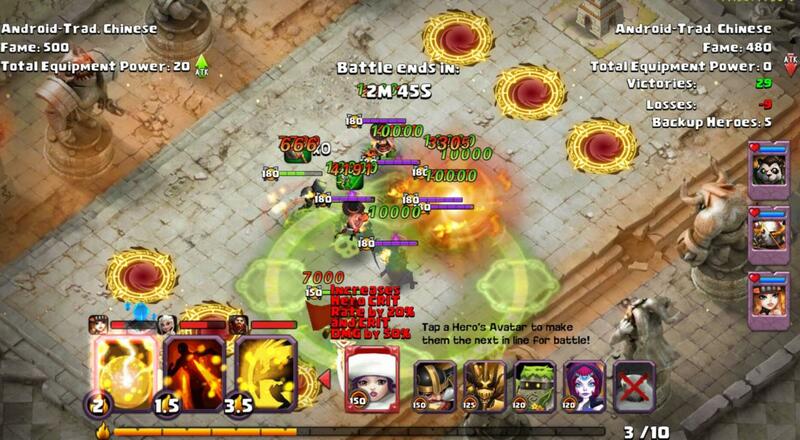 You’ll have to manually release your Heroes’ Skills and Team Skills. Using your Heroes’ Active Skill consumes Rage. Hero Skills, Team Skills, and Backup Heroes require one second to prepare before they can be released or deployed. In the event that the Active Skill was not successfully released, the consumed Rage will be returned to you. The battle will last for three minutes. After two minutes have passed in the battle, Rage recovery rate will be doubled and healing effects will be halved for both players. Victory: Destroy your opponent’s Shrine before the battle duration is over. Defeat: Your opponent destroyed your Shrine before the battle duration is over. Draw: Neither party’s Shrine was destroyed within the battle duration. Win a Coliseum battle daily to get rewards. 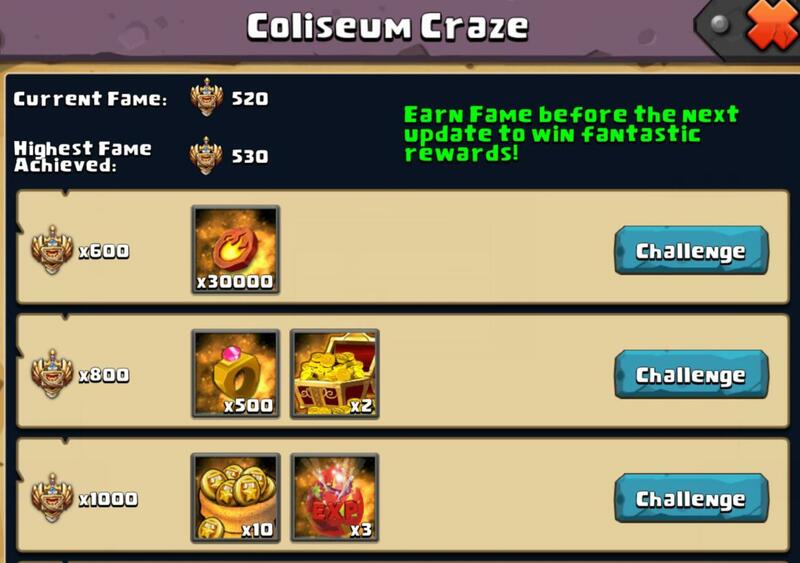 Accumulate Fame before the next update to win fabulous rewards from Coliseum Craze. The more Fame you earn, the better the rewards will be. Battle Reports will only be stored for a maximum of seven days. Only the latest 15 battle reports will be available. You can share these battle reports with your Guild. A. Fortitude Skills are not available in the Coliseum. B. Glory Statues' effects are not available in the Coliseum. C. Both active and passive spells are not available in the Coliseum. D. If either party disconnects during battle, the battle will continue. However, their Heroes’ Skills and Backup Heroes will not be released or deployed. If the disconnected player returns before the battle ends, they can continue as normal. E. A Wi-Fi prompt will appear when your connection is unstable. F. Thunder Blade will have no effect against the Shrine. G. Ten Team Skills will be available for you to choose in the Coliseum. You will be able to bring three Team Skills to battle for free. all device (android, windows phone, Amazon) in the 0ne servers...its true..